Rapid intensive treatment may prevent patients with rheumatoid arthritis (RA) from developing severe health damages and improve their state of health and quality of life. Therefore, early reliable diagnosis is a prerequisite. At present, the most helpful biomarkers to achieve this goal are antibodies against citrullinated proteins (ACPA) that can be detected in the blood of RA patients. 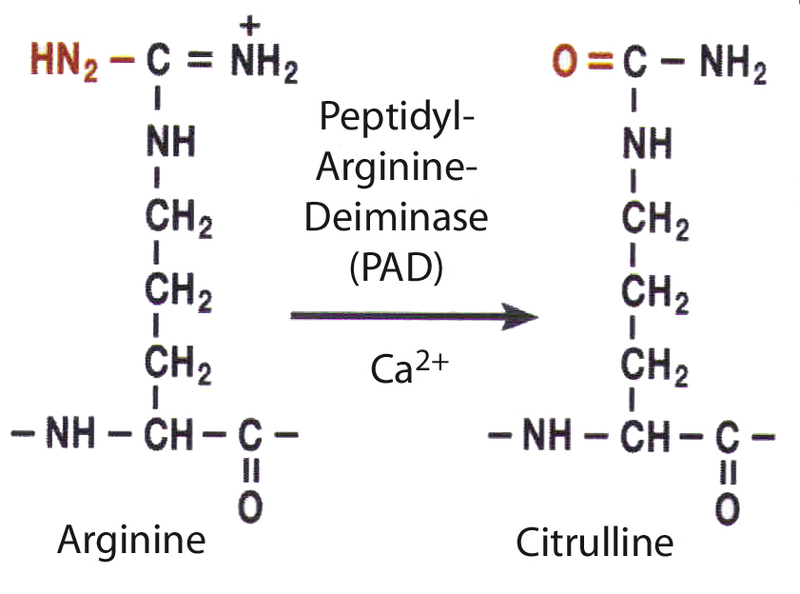 In the inflamed synovium peptidyl-arginine-deiminase enzymes convert arginine residues of endogenous proteins like vimentin or fibrinogen to citrulline. This posttranslational modification alters the three dimensional structure of the respective proteins. A recent study demonstrated, that the levels of all specific ACPAs were elevated in synovial fluid, suggesting antibody production or retention of ACPAs at the site of inflammation governed by RA-predisposing genes (Snir et al. Arthritis Rheum 2009). 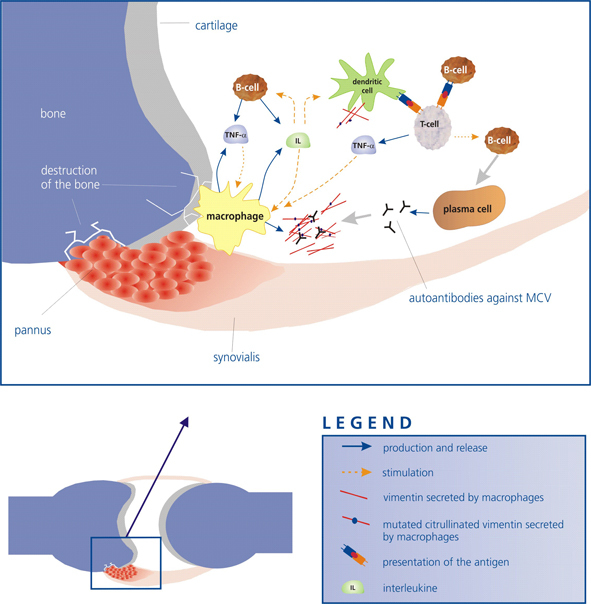 Citrullinated vimentin, historically referred to as the Sa-Antigen, is involved in the pathogenic pathways leading to rheumatoid arthritis and mutated citrullinated vimentin (MCV) has been proven to be an important autoantigen in rheumatoid arthritis (Bang et al. Arthritis Rheum 2007). It plays a crucial role in triggering ACPA production; and autoantibodies against citrullinated vimentin are especially important in early RA. The presence of citrullinated vimentin in immune complexes from RA synovial fluid further illustrates the pathological impact of this protein in RA (Van Steendam K. et al. Rheumatology 2011). At the moment, two different tests for the detection of ACPA have been established and are commercially available. One is the anti-MCV kit, which is based on the native protein mutated citrullinated vimentin. In contrast, anti-CCP kits contain a composition of different citrullinated peptides. Anti-MCV could be a better test for diagnosing RA than anti-CCP2. The study clearly has limitations due to the small number of patients and the restriction to established rheumatic disease. However, the results are in accordance with comparable clinical trials that have been published in the recent years and highlights aspects that are worth to be discussed. In contrast to CCP, the MCV antigen is an entire native protein, which contains at least 10 known citrullination sites and displays a greater number of different epitopes. For this reason the increased sensitivity of anti-MCV may be explained with the finding, that MCV is more likely to bind a variety of autoantibodies (Engelmann et al. J Rheumatol, 2009). The interesting question whether this diversity of epitope recognition of anti-MCV has further clinical implications remains to be addressed in future studies. O. Snir, M. Widhe, M. Hermansson, Spee C. von, J. Lindberg, S. Hensen, K. Lundberg, A. Engstrom, P. J. Venables, R. E. Toes, R. Holmdahl, L. Klareskog, and V. Malmstrom. Antibodies to several citrullinated antigens are enriched in the joints of rheumatoid arthritis patients. Arthritis Rheum 62 (1):44-52, 2009. H. Bang, K. Egerer, A. Gauliard, K. Luthke, P. E. Rudolph, G. Fredenhagen, W. Berg, E. Feist, and G. R. Burmester. Mutation and citrullination modifies vimentin to a novel autoantigen for rheumatoid arthritis. Arthritis Rheum. 56 (8):2503-2511, 2007. Steendam K. Van, K. Tilleman, and D. Deforce. The relevance of citrullinated vimentin in the production of antibodies against citrullinated proteins and the pathogenesis of rheumatoid arthritis. Rheumatology (Oxford), 2011. E. Besada, C. Nikolaisen, and H. Nossent. Diagnostic value of antibodies against mutated citrullinated vimentin for rheumatoid arthritis. Clin Exp Rheumatol, 2011. R. Engelmann, J. Brandt, M. Eggert, K. Karberg, A. Krause, G. Neeck, and B. Mueller-Hilke. The Anti-mutated Citrullinated Vimentin Response Classifies Patients with Rheumatoid Arthritis into Broad and Narrow Responders. J Rheumatol, 2009.